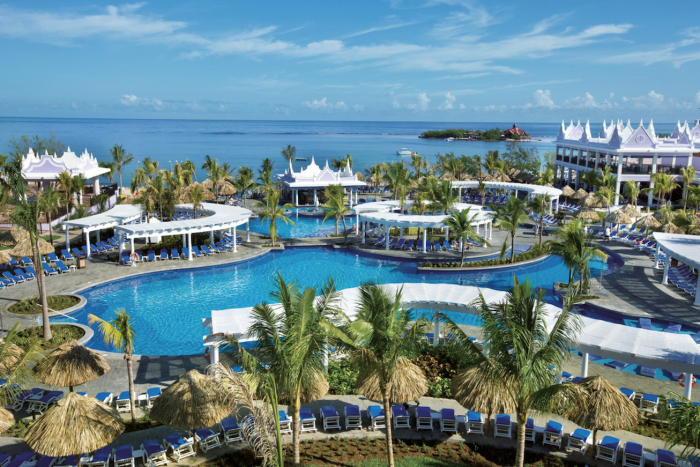 The RIU Montego Bay resort is one with nature, surrounded by 450,000 square feet of lush gardens and inspired by the island architecture of its Jamaican surroundings, perfect for a tropical destination wedding ceremony. You and your wedding guests will have quick access to downtown Montego Bay, that is if they can stand to leave the supremely large pool or pristine beachfront. For those wanting a regal destination wedding in paradise, with touches of classical colonial decor throughout, look no further than the immaculate RIU Montego Bay. 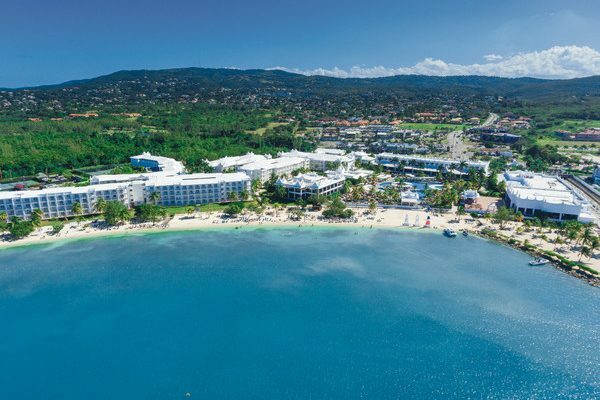 This resort sits 10 minutes away from downtown Montego Bay, so you and your wedding guests will have easy access to tourist attractions, excursions, and shopping. There is a waterpark available for kids and a 24-hour sports bar for the adults. The beach is very expansive with calm water, so the kids can easily swim. The decor throughout is inspired by Caribbean Victorian design, so it may not be the right fit if want a more mordern ceremony. 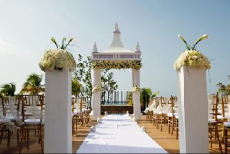 Gazebo – 100 guests max, Beach – 100 guests max. 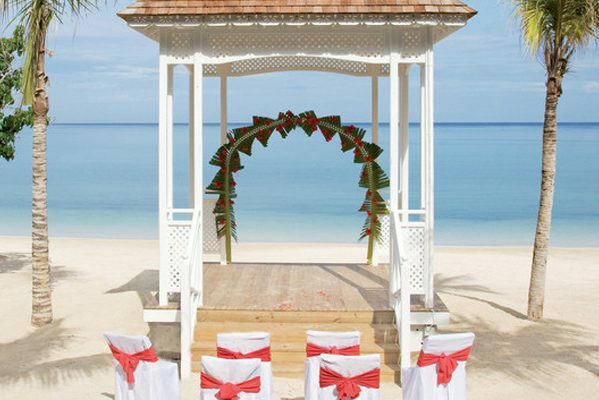 RIU Montego Bay is able to hold up to 3 weddings per day at 12pm, 2pm, and 4pm. These are the only times judges and ministers are able to perform daily. $150 – $190 average price per person per night. Rooms include private balcony or terrace and, daily restocked minibar, and 24-hour room service. Children 2 and younger stay free. There are 681 rooms with resort , partial ocean, and ocean views. 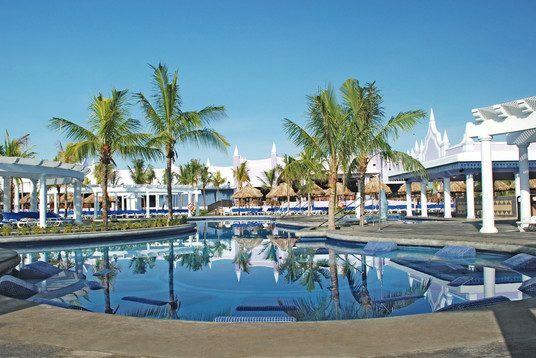 Due to the large size of the grounds this resort is recommended for more active guests. This hotel allows a maximum of 3 adults per room, or 2 adults and 2 children ages 12 and younger per room. The resort is located 1.6 miles from the MBJ airport. The resort is located 2 miles from the MBJ airport. A: 7 and a 1/2 years. A: Working with wedding couples who are laid back, interesting, exciting and a lot of fun. A: The location, the package inclusions, the spa services, the staff. Q: ​What are the challenges brides face when planning their destination wedding? A: I get asked quite often about the legality of marriages at destination weddings. Many couples are concerned, and rightly so, as there has been quite a lot of press over the years about couples getting married out of the country and then finding out later that their marriage is not legal. For most couples, cost is the biggest concern as they ponder the question, “What do we pay for?”, considering they have already booked an all inclusive holiday with food and drinks already included. Picking a destination can be overwhelming, since there are so many amazing places to choose from. It really comes down to budget, who’s in attendance (i.e. children, elderly guests), and the couple’s style. 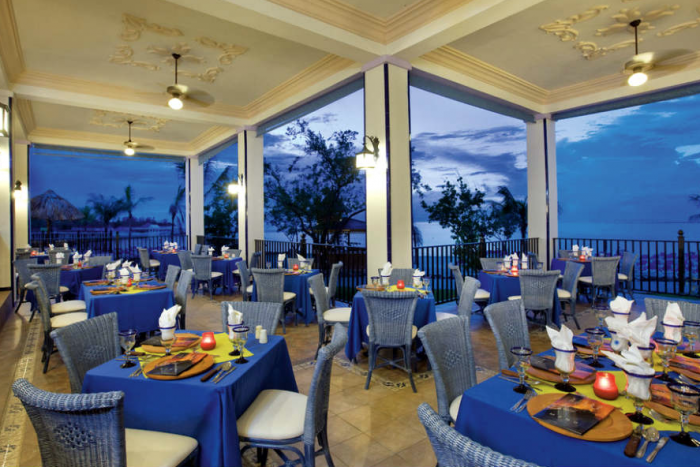 Q: Is there anything else couples should know about the RIU Montego Bay resort? A: Each resort is unique in their own way. Overall, destination weddings are designed to give the bride and groom everything they need to make their wedding day truly special. All that’s left to do is walk down the aisle and say, “I do”. 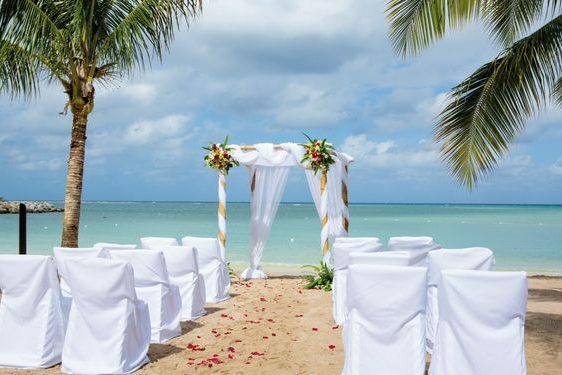 At RIU Resorts, we do weddings like no one else. We are 6 beautiful resorts in Jamaica. Couples enjoy amazing group benefits, endless customizable possibilities, and a dedicated wedding planner ready to make wedding dreams come true.